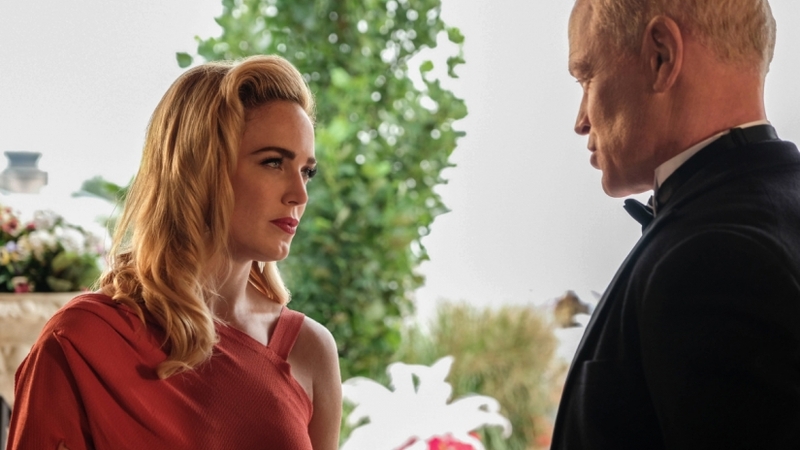 In this week's episode of Legends of Tomorrow, we open in Hollywood circa 1937. There’s a woman, wowing everyone on the lot. Well, all the men that is. She’s dragged to set where the director and producer are similarly wowed by her. They decide to replace Heddy Lemar, the star of their production, with her. Convenient that they’re shooting a picture about Helen of Troy and she’s the actual Helen of Troy. On the Waverider, the team can’t find Darhk or Eleanor. Sara instructs Nate to take a shower while Ray continues to help Stein and Jax. He has something to try on them that will hopefully help them separate. The device does something... but it looks like it’s overheating. Before Ray can shut it down, it blasts Stein and Jax, and we learn rather quickly that the two men have switched bodies. They tell the team what happened and hijinks ensue (as they often do on this show). Meanwhile, Nate finds out about the Helen of Troy anachronism. Sara says they’re going to go fix it and get their mojo back. Except for Jax and Stein, however. She tells them they have to stay on the ship because they’re a liability. In 1937, the team is positioned around the studio and the men on the team, predictably, are slobbering over her. Zari wants to talk to her but Sara insists on recon only. They witness fights break out over her. Helen, overwhelmed, flees the set and the team follows her. Before they can intercept her, she gets picked up by a man named Eddie Rothguard. Nate points out the similarities to Paris stealing Helen from Menelaus. Zari thought the story was a myth but apparently not so much. Stein-as-Jax lays out the catastrophic consequences that could befall Helen being allowed to take over Hollywood, so they all agree they need to go fetch her. They infiltrate an industry party in hopes of getting a lead. Stein-as-Jax rubs elbows with Heddy, who is more than a bit bitter that Helen is stealing her chance. Right then, Helen arrives with Eddie and the guys are all distracted by her, predictably. Sara and Zari plot to get Helen away from her entourage. It works but Helen won’t go with them. She’s enjoying Hollywood and her influence there. But then we learn her agent is Damien Darhk. He wants to talk with Sara and promises things will get ugly real fast if she doesn’t agree. So Sara wisely agrees to chat. He wants the Legends to take off and leave Helen where she is. Meanwhile, Amaya faces off with the water totem bearer, Kawasa, who is from Zambezi as well. Threats are made. It’s all very sinister. The men get in a fight over Helen and Darhk finds it delightful. He thinks its proof that Sara’s team makes a mess out of things. He wants them all to go back to 2017 and return to their lives. Or he’ll kill them all. Back on the Waverider, Sara chews the men out and tells them they need to focus on the real issue. She tells them about Darhk’s offer. Nate is curious why Darhk wants them to stop fixing anachronisms. They don’t know the answer, but they do agree to stick together and fight back. They go to the mansion where Helen is being held prisoner, pretty much while Jax and Stein banter on the Waverider. It’s cute. I’m really enjoying seeing Stein-as-Jax; he’s hilarious. Sara and the girls get in and find Helen. She doesn’t want to go back to Troy, it was a nightmare there. Then again, things aren’t looking too great in Hollywood either, with men facing off against one another. Helen believes she’s cursed. The women are going to help her but first, they have to break up the fight. Easy, for these ladies. They bring Helen onto the Waverider and learn that Gideon is offline. Stein and Jax are working on it but not getting too far. Stein explains that the reason the ship’s systems are failing is because of Heddy Lemar. She invented something which, it turns out, is important. They need to get her career back on track so they can fly the Waverider again. Jax-as-Stein heads out to fix it while Zari and Helen talk about their lives. Zari is saddened by Helen’s bleak tale of being locked away all her life. Jax-as-Stein gets Heddy from the WB switchboard and wants to set her straight but they run into Damien Darhk first. Eleanor figures out that Jax and Stein switched bodies and Darhk is delighted by this. Then he decides to kill him. And probably Heddy as well. The team is ready to come to the rescue. Jax-as-Stein and Heddy are running, hiding from Darhk and Eleanor. He tells Heddy to get to safety, focus on her dreams, and not to worry about him. He’s quickly grabbed by Darhk but the team comes and Sara proposes an old fashioned duel, no magic, just swords. On the Waverider, Zari accidentally lets Kawasa inside and she and Amaya face off. The rest of hte team attempts to deal with Eleanor but she out-magics them. Heddy is still around, she didn’t run. She urges Jax and Stein to combine their powers. Sara gets the upper hand but Eleanor comes and uses her magic on her and we learn she’s Darhk’s daughter. But before she can kill Sara, Firestorm stops her and pushes her back and away. Darhk and his daughter flee and Firestorm separates. The good news is the men are each back in their own bodies again. The bad news is Sara is in bad shape and needs to get back to the ship. On the Waverider, Helen hears Amaya fighting Kawasa. Kawasa tells Amaya that she’s her granddaughter — the rightful heir to the animal totem that went to Mari instead. Wow, I did not see that coming! Helen pops up behind Kawasa and stabs her, she transforms to water and is gone. Heddy gets an acting job at WB and she thanks Stein for his advice and help. The Waverider is back to normal so they must go. Sara is in a coma, to heal. She’ll be fine in a few days. Ray tells Amaya that Kawasa is her granddaughter and she says she knows. She understands he was just trying to protect the timeline. He tells her it’s more complicated than she thinks and he can tell her. She tells him the less she knows, the better. Zari helps Helen practice some knife fighting so she can defend herself back home. Again, she says she doesn’t want to go back there. So instead, she takes Zari to another place instead — a little island called Themyscira. Well, well, well. Helen is very grateful, especially when she learns there are no men there. And I think that’s possibly a better name drop than Bruce Wayne on Arrow a few weeks ago.